Back pain is one of the most common medical problems, affecting 8 out of 10 people at some point of time during their lives. Back pain can range from a dull, constant ache to a sudden, sharp pain. Acute back pain comes on suddenly and usually lasts from a few days to a few weeks.If back pain is more than 3 months it is called as chronic back pain.Most back pain goes away on its own, though it may take a while. Taking over-the-counter pain relievers and resting can help. However, staying in bed for more than 1 or 2 days can make it worse. To understand the sources of your particular back problem and / or how to prevent back pain, it helps to understand the anatomy of your spine. The human spine consists primarily of a line of interlocking bones called vertebrae (derived from the Latin term vertere, meaning "to turn"). Discs :- spongy material that separates your vertebrae, allowing the nerves to run between each bone segment. Discs act like shock absorbers and allow the spine to flex. Vertebra: One of a series of irregular bones that form the spine. the vertebral body and the arch; there are 33 vertebrae total: 7 Cervical, 12 Thoracic, 5 Lumbar, 5 Fused to form the Sacrum and 4 Coccygeal; feature of a typical vertebra include: body, pedicles, transverse processes, laminae, articular processes, spinous process. The vertebrae are held together by muscles, tendons and ligaments. 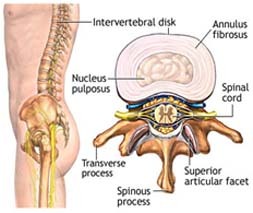 Between the vertebrae are intervertebral disks, which act as "shock absorbers" by preventing the vertebrae from hitting one another when you walk, run or jump. The intervertebral disks also allow your spine to twist, bend and extend. The two main parts of the vertebra are the vertebral body and the vertebral arch. Vertebral Body : The anterior segment and largest part of a vertebra, basically cylindrical in shape. Vertebral Arch : The posterior part of a vertebra; the vertebral arch has several processes (bony projections). The spinous process (projecting from the center of the vertebral arch) and the transverse processes (projecting from either side of the vertebral arch) serve as attachments for the muscles and ligaments. The articular processes meet and interlock at the facet joints to link one vertebra with the next. Each vertebra arch has four (two superior and two inferior) articular processes. The vertebral bodies are separated by shock absorbing intervertebral discs. Theses discs have a tough outer coating with and contain a jelly-like substance. The spinal column (also called the vertebral column) contains and protects the spinal cord and supports the body and head. 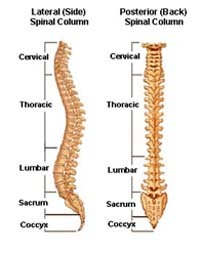 The spinal column is flexible to allow movement of the body. The spinal column is comprised of a column of small bones called vertebrae. A part of the central nervous system, the spinal cord transmits messages from the brain to other parts of the body and vice versa. The spinal cord begins at the brain and runs down to the level of the second lumbar vertebrae. Three meninges (membranes) cover the spinal cord. Spinal nerves branch out form the spinal cord. Simple back pain can occur to any person aged from 25 to 65yrs who otherwise are healthy. There are some triggering factors for simple back pain. Obesity: Your spine caries a large portion of your weight. Being overweight puts pressure and stress on the back, especially the low back. Plus, carrying excess weight aggravates other health conditions such as osteoporosis (weak bones), osteoarthritis (joint pain), rheumatoid arthritis (an autoimmune disease), degenerative disc disease, spinal stenosis, and spondylolisthesis. Spine is very strong part of our body and is not easily damaged. If a person stays physically active he will be free from pain. 9 out of ten people with back pain recover within few weeks. Most of the time, your doctor will only need to discuss your symptoms and examine you for back pain. If the pain lasts longer than six weeks, or if your doctor suspects there is some underlying cause of the pain, then he or she may recommend more tests. Mental wellbeing of a person also has a role in back pain. If the condition is chronic, your doctor may recommend that you have an assessment of your wellbeing in a pain clinic. 'Conservative treatment' is a common term used for describing the different types of non-surgical treatments. As almost all people who have spine-related problems do not need surgery, conservative treatment plays a major role in treatment of spinal disorders. However, there is a wide selection of conservative treatments available and sometimes it can be very difficult to make sense of all the choices. NSAIDs, Pain reliever, Muscle relaxants, spinal injections and antidepressants are used in back pain. NSAIDs work by reducing inflammation and providing pain relief. Inflamed ligaments and joints can cause pain directly or by irritating nerves as they leave the spine. NSAIDs must be taken on a regular basis at therapeutic dosing to have a true anti-inflammatory effect. Conservative treatment is always the first option in order to reduce pain. The most common form of treatment that is used is physical therapy. Physical therapy offers a wide range of treatments for back problems. Only a small minority of patients suffering from low back pain ever require surgery. In the absence of severe or progressive weakness, or signs of cauda equina syndrome, elective surgery is an option for patients with chronic low back pain and significantly impaired quality of life who have not responded to adequate trials of non-surgical approaches. Regular exercise is an essential part of maintaining a healthy back. In the treatment of back pain, exercise plays an important role in recovery. Each day we make demands on our bodies that can place stress on our backs. The more fit you are and the stronger your back is, the more easily your body can deal with the stress and strain of everyday activity.